Michael Tyler wasn’t always a vampire. At one point in his life he was an earnest young man who wanted only to help people by becoming a doctor. But his life is irrevocably changed one night when he stops to help the wrong person. Awakening the next day to the horrific realization of what he has become sends Michael on a terrifying rampage that lasts many decades. When he finally learns to control the beast that now lives within, he knows it’s not safe for him to be around people so he flees England for a remote piece of property in the mountains of Colorado where he has now lived for more than a century, interacting with people only when necessary. Nicole Whitcomb is also running from her past following a tragic event that changed the course of her life. After attending the destination wedding of a friend, Nicole is driving to the airport to fly home when she’s caught in a freak snowstorm in the mountains of Colorado. Her car crashes and she’s certain her life is about to end so she’s understandably shocked when she awakens in the warmth and comfort of a beautiful mountain home with a gorgeous man at her side. There are worse things than being snowbound with a man who seems to have been made just for you but Michael blows hot and cold, affectionate one minute, cold and harsh the next. There is little food in the house, he never joins her for meals and rarely sleeps. It isn’t long before the many clues start to add up and Nicole begins to suspect that there’s more to the mysterious Michael Tyler than meets the eye. Will their deepening feelings for one another be able to withstand the truth or will it send Nicole running for her life? 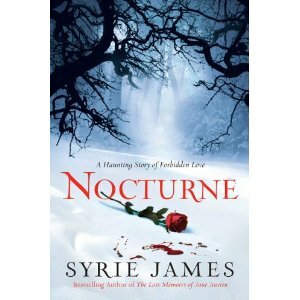 Syrie James has written a deeply sensuous, hauntingly beautiful love story of two wounded individuals coming together. By setting the story in a remote snowbound location, we see only Nicole and Michael and the effect of their isolated situation is heightened emotions, fears, joy and frustration. Michael, in particular, broke my heart. His love for Nicole is so deep, so unselfish, so filled with fear that he won’t be able to control his vampire side. He’d rather die than hurt her but he may not have a choice. This was my first Syrie James book but it won’t be my last. I’ve already ordered her back list and am looking forward to losing myself in her stories. Her writing is exquisite and compelling, pulling in the reader and continuing to hold them tightly long after the final page of the book is read. Nocturne doesn’t have a traditional romance ending but I was left with the hope of one (be sure to read the Author’s Note at the end). Still, even without the ending I normally want, I wouldn’t have missed the experience of reading Michael and Nicole’s story. I highly recommend this book. Covers draw me into books by authors I had not read before. This cover is amazing and the book has caught my interest. Thanks for the review. Great review, PJ! I'm intrigued at the non-traditional ending and the author's note at the end. I may just have to check this out! Chris, that cover is so compelling, isn't it? This is such a beautifully written story. I'm looking forward to reading more from this author! Trisha, I think you'd enjoy it! Buffie, it's a very intriguing story. I'm hoping the author might choose to re-visit these characters again someday. Gannon, I think this one will really draw you in! Hope you enjoy it, Helen! How are the plans for ARRC coming? Sure wish I could be there to enjoy it with you! Have seen this book reviewed, but your comments are a bit different, as usual, especially about the ending. I am more intrigued than ever about this book. Thanks for another good review. I enjoyed reading the blurb. Thank you for the review. Always helpful to know! !